Introducing Content Curation for WordPress! CurateWP provides an easy way for authors and editorial teams curate their content across their WordPress websites. I built CurateWP out of a need I saw publishers had for their websites that no single plugin was able to solve. In the past, the ability to surface content into different areas of a website required custom development at a high cost with a limited feature set. Confusing methods like assigning a certain taxonomy to have a post display in different areas was hard to track and wasn’t the most elegant solution. CurateWP solves all these problems and more in the most elegant way. You can check out all of the features but I’d like to call out a few important ones. On the outset CurateWP includes manual and automatic methods for populating a curated section with your content. For each section you create you can search for and add individual pieces of content and order them however you like. You can also configure a query to automatically populate the section with content. You can even mix the methods together for ultimate flexibility! There is a hook available that gives you complete control of the queries. The methods are designed to be extensible in the future so look out for new methods being added soon. Publishers can have thousands or hundreds of thousands of posts in their archive which is a problem when pulling this content into different areas of the website. CurateWP optimizes the queries generated to minimize the load on the database and utilizes caching to prevent queries from being executed multiple times on each page. 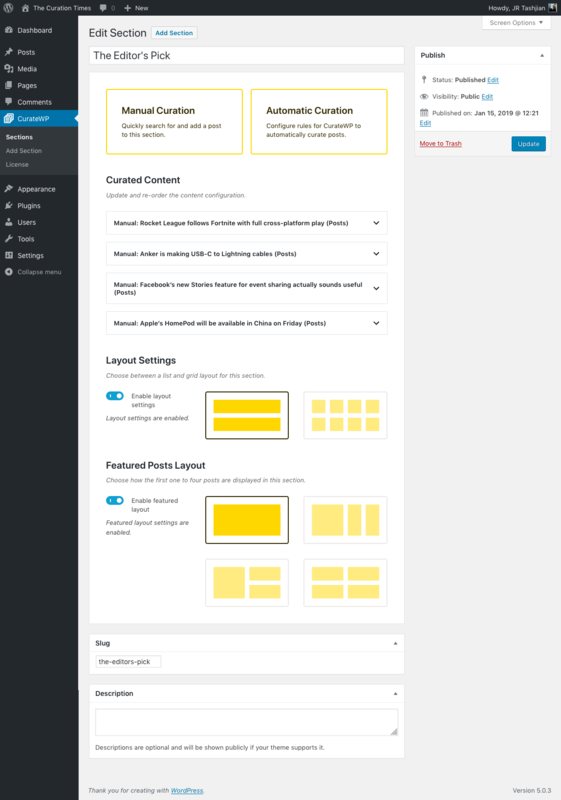 When you have as much control as CurateWP provides, you want to ensure that the same piece of content doesn’t display in another section on the same page. CurateWP handles this for you automatically. When using the automatic curation method in a section, CurateWP will make sure content isn’t duplicated on a single page. You can override this behavior through the manual curation method. Check out how you can use CurateWP and watch the quick visual overview below to see for yourself how quickly and easily you can setup curated sections on your website.